High sensitivity identification of sulfated glycans carried on specific sites of glycoproteins is an important requisite for investigation of molecular recognition events involved in diverse biological processes. However, aiming for resolving site-specific glycosylation of sulfated glycopeptides by direct LC-MS2 sequencing is technically most challenging. Other than the usual limiting factors such as lower abundance and ionization efficiency compared to analysis of non-glycosylated peptides, confident identification of sulfated glycopeptides among the more abundant non-sulfated glycopeptides requires additional considerations in the selective enrichment and detection strategies. Metal oxide has been applied to enrich phosphopeptides and sialylated glycopeptides, but its use to capture sulfated glycopeptides has not been investigated. Likewise, various complementary MS2 fragmentation modes have yet to be tested against sialylated and non-sialylated sulfoglycopeptides due to limited appropriate sample availability. In this study, we have investigated the feasibility of sequencing tryptic sulfated N-glycopeptide and its MS2 fragmentation characteristics by first optimizing the enrichment methods to allow efficient LC-MS detection and MS2 analysis by a combination of CID, HCD, ETD, and EThcD on hybrid and tribrid Orbitrap instruments. Characteristic sulfated glyco-oxonium ions and direct loss of sulfite from precursors were detected as evidences of sulfate modification. It is anticipated that the technical advances demonstrated in this study would allow a feasible extension of our sulfoglycomic analysis to sulfoglycoproteomics. The online version of this article ( https://doi.org/10.1007/s13361-018-1919-9) contains supplementary material, which is available to authorized users. High sensitivity mass spectrometry (MS)-based identification of sulfate modification on a diverse range of sialylated mammalian N-glycans remains technically challenging despite its well-appreciated biological importance (see ). Time and again, glycan array screening revealed that many endogenous glycan-binding proteins including members of the important classes of selectins and Siglecs bind the sulfated counterparts of their cognate ligands at significantly higher affinity. The prime examples are the 6-sulfo sialyl LeX expressed on the high endothelial venule of peripheral lymph node that mediates lymphocyte homing [2, 3], and the 6-sulfo-α-2,6-sialyl LacNAc on human B cells that constitutes a higher affinity ligand of human CD22, an inhibitory co-receptor of B cells [4, 5]. In most cases, whether a terminal glyco-epitope or glycotope would be presented at optimal density, valency and accessibility to function as a proper recognition code is critically dependent on the underlying glycan structures and specific site localization on particular glycoprotein carriers. Moreover, additional modifications such as sulfate would attenuate the binding affinity by conferring negative charge at or near the contact sites, to the extent that it may ultimately fine tune and determine its pathophysiological consequences. To address the occurrence and functional consequences of sulfate modifications, we have recently established the enabling sample preparation and MS techniques for identifying sulfated glycans, thus making significant headways in sulfoglycomics [6, 7]. However, for reasons elaborated above, a grand challenge in all glycomic studies is whether the identified, biologically relevant glycotopes can be further localized to which protein carriers at which sites in a follow-up glycoproteomic venture [8, 9]. To date, while many heavily O-glycosylated mucins are known to carry sulfated O-glycans, only a handful of glycoproteins have been biochemically characterized to carry sulfated N-glycans and far too few were directly demonstrated at glycopeptide level by MS. It is not known if there is generally a low sulfation level for most N-glycosylated sites, or the distribution of sulfated N-glycans has a distinctive protein site-specific preference. To answer such critical questions, a reliable and highly sensitive method that can confidently detect the typically low abundant sulfated N-glycopeptides among the complex proteomic digests is needed. 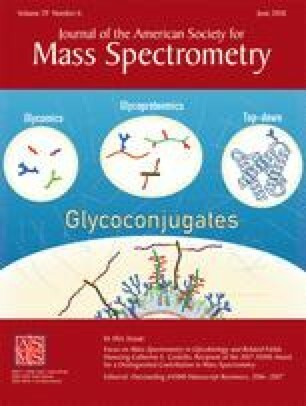 The key limiting factors in all MS-based glycoproteomics are satisfactory glycopeptide enrichment, diagnostic ions to filter, select and identify a glycopeptide, sufficient peptide backbone cleavage ions to allow unambiguous sequencing and site localization, and computational tools to facilitate data analysis. These issues have each been intensively studied and discussed recently [10, 11, 12, 13]. Although many different variations of enrichment methods and formats have been developed, the principles largely converged on selective capture based on lectin affinity or higher hydrophilicity and/or larger size imparted by the extra glycan moiety carried on the peptide backbone. In the context of sulfated glycopeptides, no suitable lectin or universally applicable antibody is currently available. On the other hand, their extra negative charge makes it attractive for enrichment methods based on ionic interactions or metal chelation such as the titanium dioxide (TiO2) method originally developed for phosphopeptides but has since been adapted to sialoglycopeptides [14, 15]. It is, however, untested and unknown if sulfated glycopeptides can actually be selectively captured by TiO2 and whether these can be discriminated from equally negatively charged sialylated glycopeptides. We have previously shown that sulfated glyocopeptides from recombinant erythropoietin (rEPO) produced in BHK 21 cells could be efficiently captured by amine-functionalized magnetic nanoparticles, along with other glycopeptides without any apparent specificity or enrichment preference . Toyoda et al. demonstrated a strategy by utilizing ion exchange chromatography to enrich sulfated N-glycopeptides from bovine luteinizing hormone after limited protease digest and modification with acetohydrazide that neutralized all carboxylic groups . Unfortunately, its applicability to capturing intact sulfated sialylated glycopeptides has not been demonstrated. With or without prior enrichment, detection of glycopeptides is facilitated by the abundant diagnostic glyco-oxonium ions resulting from facile glycosidic cleavage at GlcNAc [18, 19]. In particular, HexNAc+ at m/z 204.0867 and Hex-HexNAc+ at m/z 366.1396 are almost universally produced by conventional beam type collision induced dissociation (CID) as implemented on a Q/TOF instrument or, more recently, by higher energy collisional dissociation (HCD) on various Orbitrap-based instruments. Positive detection of these oxonium ions at high mass accuracy are now commonly used in many data analysis tools as a criterion to filter out true glycopeptide MS2 spectra and/or positively contributing to identification scores . Their detection by HCD MS2 in the initial LC-MS/MS data-dependent acquisition event on a hybrid or tribrid Orbitrap instrument is also commonly defined as criteria to trigger additional product-dependent acquisition of other MS2 data such as ion trap CID or electron transfer dissociation (ETD) [20, 21]. In general, glycopeptides carrying different terminal sialylated and/or fucosylated glycotopes, with and without other non-saccharide substituents, are expected to yield the corresponding diagnostic oxonium ions [19, 22], but the prospect of detecting diagnostic sulfated glyco-oxonium ions indicative of sulfated N-glycopeptides for selective data acquisition or analysis has not been investigated. Although HCD and other beam type or ion trap CID MS2 alone may be sufficient for glycopeptide identification, current state-of-the-art glycoproteomics increasingly relies on complementary use of all three MS2 modes, namely HCD, trap CID, and ETD, available on the hybrid LTQ-Orbitrap or tribrid Orbitrap Fusion instruments [13, 23, 24]. It is now well appreciated that ion trap CID provides more fragment ions corresponding to sequential losses of glycosyl residues from the precursor, with very few peptide sequence informative b and y ions. HCD fragmentation is generally similar to trap CID but typically yields more of the peptide backbone cleavages and the oxonium ions without the low mass cutoff problem associated with trap CID. ETD, on the other hand, would retain the intact glycan but produces a more complete series of c and z peptide cleavage ions. This is particularly useful for site localization when sequencing O-glycopeptides , but this fragmentation mode is generally less efficient and better suited for glycopeptides of higher charge density with overall low m/z values. Supplemental activation is thus often introduced to promote more fragmentation. Recently, this takes on a new activation mode on the Orbitrap Fusion, which itself offers a much improved ETD performance. In the so-called EThcD, additional HCD at lower energy than that of standalone HCD was applied after initial ETD activation [25, 26]. The fragmentation characteristics of glycopeptides under these different MS2 modes have been well studied and documented [12, 13, 23, 27] but not extended to sulfated N-glycopeptides. As a prerequisite for any meaningful MS-based sulfoglycoproteomics, we have set out in this work to investigate the LC-MS2 characteristics of sulfoglycopeptides on both the hybrid and tribrid Orbitrap instruments, focusing on the sulfated N-glycopeptides derived from tryptic digests of a largely non-sialylated rEPO from BHK21 cells and the highly sialylated bovine thyroglobulin (bTG). We demonstrated that TiO2 could be used to enrich the sulfated N-glycopeptides, but better specificity was attained for sialylated glycopeptides. Sulfated glyco-oxonium ions, particularly that of sulfo LacNAc (Hex-HexNAc), could indeed be detected under HCD and EThcD and used as criterion for selective filtering of sulfoglycopeptide MS2 spectra. Direct loss of a sulfite moiety from the precursors under trap CID and EThcD would constitute another important cue for verifying the presence of sulfate substitution. Formation of these diagnostic ions would be adversely affected by sialylation but could be partly alleviated. Other than these features, the overall MS2 fragmentation pattern for N-glycopeptides as currently known for the different modes of MS2 is not significantly altered by carrying an extra sulfate, and thus, their reliable sequencing and identification are subjected to the same practical considerations and shortcomings. Thyroglobulin from bovine thyroid (bTG) was obtained from Sigma-Aldrich (St. Louis, MO). Recombinant erythropoietin (rEPO) from BHK21 cells was purchased from Advanced Gene Technology Corp. (Taiwan). ZIC-HILIC® (Zwitterionic Hydrophilic Interaction Liquid Chromatography) ProteaTip Sample Prep Kit was from Protea Biosciences (Morgantown, WV), titanium dioxide TiO2 (Titansphere, 5 μm) from GL Sciences Inc. (Japan), peptide N-glycosidase F (PNGase F) and Arthrobacter ureafaciens neuraminidase from Roche Diagnostics (Mannheim, Germany), and sequencing grade, modified trypsin from Promega (Madison, WI). Proteins were reduced with 10 mM dithiothreitol at 37 °C for 1 h, alkylated with a final concentration of 50 mM iodoacetamide in 25 mM ammonium bicarbonate buffer for 1 h in the dark at room temperature. After that, the concentration of dithiothreitol was adjusted to 50 mM and proteins were treated overnight with sequencing grade trypsin at an enzyme-to-substrate ratio of 1:50 at 37 °C. The digested products were then diluted with formic acid to a final concentration with 0.1% for further experiments. One hundred forty microgram bTG protein was dissolved in 6 M urea with 25 mM ammonium bicarbonate buffer and reduced by 10 mM dithiothreitol at 37 °C for 1 h, followed by alkylation with 50 mM iodoacetamide at room temperature for 1 h in the dark. The sample was further diluted with 25 mM ammonium bicarbonate buffer to a final concentration of 1 M urea and digested overnight with trypsin at 37 °C. After heat denaturation, the peptides were treated overnight with PNGaseF at 37 °C to release N-glycans. Released N-glycans were isolated from peptides by passing through a C18 Sep-Pak cartridge (Waters) in 5% acetic acid and dried down by SpeedVac. Slurry of ground NaOH pellets in dimethyl sulfoxide was added to dried glycan samples in glass tube, followed by addition of methyl iodide. The reaction was carried out at room temperature for 30 min with gentle vortex and then terminated by dropwise addition of water. The permethylated glycans were extracted into chloroform, washed repeatedly with water, and then dried down under a stream of nitrogen. The permethylated glycan samples were mixed 1:1 with either 2,5-dihydroxybenzoic acid (DHB) matrix solution (10 mg/mL in 50% acetonitrile) for positive ion mode detection or 3,4-diaminobenzophenone (DABP) matrix (10 mg/mL in 50% acetonitrile) for negative ion mode on a MALDI target plate. Data acquisition was performed manually on the MALDI TOF/TOF 5800 system (Sciex) and operated in the reflectron mode. The laser intensity was set at 4500, and 5000 shots were used to generate one spectrum. Procedures used to enrich sulfated glycopeptides were modified according to the methods used to enrich sialoglycopeptides . Briefly, peptide mixtures were diluted with TiO2 loading buffer (1 M glycolic acid, 80% acetonitrile, 1% trifluoroacetic acid (TFA)) in 1:10 ratio, added to TiO2 beads, and incubated for 30 min in a vortex mixer. The supernatant was then removed after centrifugation, and the beads were washed with loading buffer for 1 min by incubation in the mixer. After settling down the beads by centrifugation, the supernatant was removed and the beads washed sequentially with washing buffer I (80% acetonitrile, 1% TFA) and washing buffer II (2% acetonitrile, 0.1% TFA) before drying down in a SpeedVac. The bound glyocopeptides were eluted by incubating with elution buffer (1.5% ammonia in water) for 20 min in the mixer, then collected into the supernatant after centrifugation and dried down. The glycopeptides were derivatized according to procedures described in previous work  but with some changes. Peptide mixtures were dried down and dissolved in 100 μL of 1 M acetohydrazide (adjusted to pH 3.5–4 with 0.5 N HCl) for 10 s with vortex. One hundred microliters of 0.5 M N-ethyl-N′-(3-dimethylaminopropyl) carbodiimide hydrochloride (EDC) in 1:1 water/methanol solution was then added to the sample solution. The mixtures were vortexed for 10 s, and the solution evaporated using SpeedVac. The pellet was resuspended in 500 μL of 1:1 water/methanol solution, vortexed, and evaporated again. Finally, the pellet was redissolved in 0.1% formic acid for cleanup. Samples for LC-MS2 analyses were cleaned up using ZipTip C18 (Millipore), dried down, and redissolved in 0.1% formic acid. For analysis of sulfated glycopeptides with various fragmentation modes, data were performed on an LTQ-Orbitrap Elite or an Orbitrap Fusion Lumos Tribrid mass spectrometer (Thermo Scientific), fitted with a PicoView nanospray interface (New Objective) and a nanoACQUITY UPLC system (Waters) (for LTQ-Orbitrap Elite) or Easy-nLC 1200 (for Orbitrap Fusion Lumos Tribrid) (Thermo Scientific). For nanoACQUITY UPLC system, peptide mixtures were loaded onto a 75 μm × 250 mm nanoACQUITY UPLC BEH130 column packed with C18 resin (Waters) and were separated at a flow rate of 300 nL/min using a linear gradient of 5 to 55% solvent B (95% acetonitrile with 0.1% formic acid) in 35 min. Solvent A was 0.1% formic acid in water. For Easy-nLC 1200, peptide mixtures were loaded onto an Acclaim PepMap RSLC 25 cm × 75 μm i.d. column (Dionex) and separated at a flow rate of 300 nL/min using a gradient of 5 to 45% solvent B (100% acetonitrile with 0.1% formic acid) in 60 min. Solvent A was 0.1% formic acid in water. The mass spectrometer was operated in the data-dependent mode. Briefly, survey full-scan MS spectra were acquired in the Orbitrap with the resolution set to 120,000. The most intense ions (Elite) or highest charge state ions (Lumos) were sequentially isolated for MS2 analysis using the following settings: CID MS2 fragmentation and detection in the ion trap on Elite with AGC target at 5 × 104, isolation window 3, collision energy (%) 35; HCD MS2 with detection in the Orbitrap on Elite with AGC target at 5 × 104, isolation window 3, collision energy (%) 30, resolution 30,000; HCD MS2 with detection in the Orbitrap on Fusion Lumos with AGC target at 5 × 104, isolation window 2, collision energy (%) 28. An HCD-pd-ETD workflow was employed to additionally trigger ETD events upon detecting the HCD product ions at m/z 204.0867, 138.0545, and 366.1396. Supplemental activation was enabled on the LTQ-Orbitrap Elite, and the ETD MS2 ions were detected in ion trap. Similar HCD-pd-EThcD was enacted on the Orbitrap Fusion Lumos using the same HCD product ions to trigger EThcD. For EThcD, the calibrated charge-dependent parameter was used and supplemental activation was allowed with a 15% SA collision energy. The EThcD ions were detected in the Orbitrap at a resolution of 60,000. While direct LC-MS/MS analysis of the proteolytic digests of an isolated glycoprotein is highly desirable, some form of glycopeptide enrichment is inevitable for analysis at the glycoproteomic level. Even for single glycoprotein, efficient enrichment of sulfated glycopeptides would be required since the degree of sulfation is typically low. We thus set out to evaluate if the more commonly used glycopeptide enrichment method would allow satisfactory recovery of sulfated glycopeptides. rEPO produced in BHK21 cells is unique in that it is highly sulfated with very little sialylation  and hence provide an ideal sample to evaluate if the negatively charged sulfate carried on the glycans can be relied on for enrichment in the same manner that sialylation (and phosphorylation) allows their selective capture by TiO2. Once the characteristic features including the MS2 patterns were established, a more complex sulfated and sialylated glycoprotein, bovine thyroglobulin (bTG), was employed to further evaluate how these may differ when sialylation co-exists with sulfation to give terminal sialylated sulfo LacNAc glycotopes, from the perspectives of glycopeptide enrichment, chromatography on reverse phase (RP) C18 capillary column, and the differential fragmentation patterns under different MS2 modes. We first attempted to enrich sulfated glycopeptides with commercialized ZIC-HILIC tip according to recommended procedures. Applying to tryptic peptides derived from sulfated rEPO glycoprotein, we detected only sulfated O-glycopeptides but no sulfated N-glycopeptides (data not shown) after ZIC-HILIC enrichment, suggesting that this procedure may not be suitable for general sulfated glycopeptide enrichment. We then adopted conditions used to enrich sialylated glycopeptides by TiO2  to the same sample. With 5% TFA in glycopeptide sample loading step, only the sulfated O-glycopeptides could be efficiently retained by TiO2 (Fig. S1D) and not the sulfated N-glycopeptides (Fig. S1A). We found that decreasing the acid concentration in loading step from 5 to 1% TFA or even 0.1% significantly increased the signals detected for not only sulfated O-glycopeptides (Fig. S1E and F) but also sulfated N-glycopeptides from rEPO (Fig. S1B and C). However, the use of 0.1% TFA in sample loading step significantly increased the non-specific binding of peptides. Therefore, 1% TFA was chosen as the optimized sample loading condition for TiO2 enrichment in all subsequent work. For rEPO produced in BHK21 cells, the monosulfated glycopeptides could be readily detected as multiply protonated species (Fig. 1a), typically in more than one charge states and accompanied by minor forms of ammonium/sodium adducts, after a simple step of TiO2 enrichment. The non-sulfated glycopeptides were, however, not excluded by the enrichment, whereas disulfated ones could be additionally detected. It is noted that the additional presence of a sulfate moiety would significantly increase the retention time of the tryptic glycopeptides on a RP C18-nanoLC capillary column, as evidenced from an overlapping extracted ion chromatogram plot of the non-sulfated, monosulfated, and disulfated N-glycopeptides carrying the same peptide backbone and non-sialylated, LacNAc4-containing complex type N-glycan (Fig. 1b). In contrast, extra LacNAc units would shift the elution to slightly earlier time as it increases the overall hydrophilicity by the glycan size. As expected, HCD MS2 afforded a series of fragment ions corresponding to intact peptide backbone retaining one or more of the glycosyl residues including the so-called Y1 ion at m/z 1281.6992+ (Fig. 1c) for the quadruply charged precursor at m/z 1235.28474+ selected for exemplary MS2 analyses. More importantly, very low abundant oxonium ions for sulfated HexNAc (m/z 284.044), LacNAc (m/z 446.098), and di-LacNAc (m/z 811.232) could be detected by Orbitrap at high resolution and mass accuracy to be used as cues to filter out HCD MS2 spectra of sulfated glycopeptides for a rapid survey of the presence of sulfated glycopeptides (Fig. 1b), in analogy to the use of the common oxonium ions at m/z 204 and 366 to filter out glycopeptide MS2 spectra [19, 24]. Measured here at a mass accuracy less than 3 ppm, their detection also allows discriminating sulfated from isobaric phosphorylated ions. Such sulfated glyco-oxonium ions appears not to be sufficiently produced by trap CID MS2 (Fig. 1c) or ETD MS2 (Fig. 1d) on a hybrid LTQ-Orbitrap Elite instrument. Instead, a characteristic loss of a sulfite moiety (80 u) and sulfated LacNAc (445 u) from the quadruply charged precursor was detected for CID MS2, and similar loss of sulfite was also observed for ETD MS2, whereas HCD only afforded loss of sulfated LacNAc. For disulfated glycopeptides, two consecutive losses of sulfites, or a sulfite and a sulfated LacNAc, could be observed by trap CID MS2 (Fig. S2). The same pattern was observed for the rEPO O-glycopeptides (Fig. S3), pointing towards a common pattern of sulfite and/or sulfated LacNAc loss from the precursor as a diagnostic feature for identification of sulfated glycopeptides by MS2. This is equally true for the disulfated glycopeptides from bovine glycoprotein hormone carrying two sulfated lacdiNAc termini, where loss of sulfite and sulfated lacdiNAc by CID MS2 was readily detected (Fig. S4). Other than these sulfate-specific ions, the overall MS2 pattern of the sulfoglycopeptides generally follows that understood for non-sulfated glycopeptides [12, 13, 27], namely HCD and CID yielded mostly Y series of ions due to extensive losses of glycosyl residues, with very few peptide backbone cleavage b or y ions. On the contrary, favorable ETD produced mainly c and z peptide cleavage ions, with occasional loss of glycosyl residues attributable to the applied supplemental activation. It should, however, be noted that probably due to higher performance and efficiency of the EThcD in the newer generation Orbitrap Fusion series, the sulfated glyco-oxonium ion at m/z 446.098 could be detected (see later examples and Fig. 4) and similarly mass measured at high mass accuracy, and thus could equally be used to filter out EThcD MS2 spectra of sulfated glycopeptides from a large LC-MS/MS dataset. Most sulfated glycotopes functionally implicated in biological processes are sialylated, such as sulfo sialyl LacNAc or sulfo sialyl LeX . Having established the enrichment and MS2 fragmentation characteristics of non-sialylated, sulfated glycopeptides from rEPO, we next turned to bTG, a major protein of thyroid secretory epithelium cells with a molecular weight of 330 kDa, as a source of sialylated and sulfated glycopeptides. Thirteen out of 14 putative N-glycosylation sites of bTG have previously been confirmed to be N-glycosylated, of which 9 sites were inferred to carry hybrid or complex type N-glycans . Although sulfate modification on the N-glycans of bTG is well supported by identification of Gal-3-SO4 and GlcNAc-6-SO4 , the overall sulfated N-glycan profile and whether there is any site-specific distribution of the sulfated glycoforms remain undefined. To facilitate glycopeptide mapping and identification, the total N-glycans were first released from bTG, permethylated and analyzed by MALDI-MS in positive and negative ion mode for non-sulfated and sulfated glycans, respectively. We have previously shown that permethylation will retain the sulfate moiety and hence the negative charges imparted . On the other hand, sialic acids will be methyl esterified and thus charge neutralized. As such, the sulfated permethylated glycans could be separated from the non-sulfated permethylated glycans by virtue of simple ion exchange-based solid-phase extraction cartridge [33, 34]. However, for larger N-glycans such as those derived from bTG, and when separation into two populations is not needed, simple cleanup after permethylation by chloroform/water partitioning was found to retain all non-sulfated and sulfated permethylated N-glycans in the organic phase and could then be selectively detected by MALDI-MS. In positive ion mode, all peaks detected could be assigned as monosodiated molecular ions (Fig. 2a). Other than the high mannose structures, the major complex type N-glycans as inferred from their masses and deduced glycosyl compositions correspond to core fucosylated, biantennary, triantennary, and tetraantennary structures bearing an extra Gal or NeuAc at the various LacNAc termini, with no obvious sulfate modification. However, when switching to negative ion mode, a series of signals could be detected and assigned as [M-H]− of their monosulfated counterparts (Fig. 2b). Among the most abundant ones are the monosulfated, monosiaylated, and disiaylated biantennary and triantennary core fucosylated N-glycans, with and without extra Gal residue. In addition, some minor sulfated species could only be detected as [M-H]− in negative ion mode, including those at m/z 2023, 2198, 2490, and 3750 (see tentative assignment on Fig. 2b). Overall, bTG is not only a good source of sialylated sulfoglycopeptides but, due to its large size, also provides a high complexity of non-sulfated sialoglycopeptide and peptide mixtures to test the efficiency of sulfated glycopeptide enrichment. It appears that after TiO2 enrichment, both non-sulfated and sulfated sialylated glycopeptides were detected by MS (Fig. 3a), whereas the sialylated sulfoglycopeptides were hardly detected without enrichment. Based on the criteria of detecting the diagnostic oxonium ion at m/z 366.140 above an ion intensity of 100 as evidence of glycopeptides, only about 40% of all HCD MS2 in non-enriched sample could be attributed to glycopeptides, which increased to around 74% after enrichment. Consistent with that observed for the non-sialylated N-glycopeptides from rEPO, additional sulfate moiety on otherwise identical sialylated glycopeptides increased their retention time on a RP-C18 nanoLC column (Fig. 3b inset). Comparing the trap CID MS2 of a non-sulfated (Fig. 3b) to a sulfated (Fig. 3c) sialylated N-glycopeptide revealed that pairs of fragment ion signals with the mass difference corresponding to a sulfite group were only detected in the CID MS2 spectrum of the sialylated sulfoglycopeptide. These could be attributed to either a direct loss of sulfated glycosyl moiety or additional loss of a sulfite moiety accompanying independent loss of glycosyl residues. Unlike the case with non-sialylated sulfoglycopeptides (Fig. 1d), a direct loss of sulfite from the precursor was not always observed (Figs. 3c and S5C). Its production was somewhat dependent on the exact structure of the sialylated multiantennary N-glycan itself rather than the peptide backbone (Fig. S6). In contrast, a direct loss of a sulfite moiety from the precursor could be detected under EThcD for all cases of bTG sialylated sulfoglycopeptides examined (Figs. 3e, 4, and S5D), with and without also inducing losses of other sulfated glycosyl moieties. On the other hand, loss of both sulfite and sialic acid that was common by trap CID (Fig. S6) was not observed under EThcD (Fig. 4) for the same set of sialylated sulfoglycopeptides. Sulfated oxonium ion corresponding to sialylated sulfo LacNAc was never detected while that of sulfo LacNAc could be observed in the HCD MS2 spectra (Fig. 3d) but typically at very low intensity. Not only would EThcD on an Orbitrap Fusion commonly afford loss of sulfite from the precursor itself but also direct loss of a sulfo LacNAc along with production of an oxonium ion of sulfo LacNAc when a non-sialylated sulfo LacNAc antenna is present among the multiantennary sialylated complex type N-glycans (Fig. S5D). This is true for all three sites of bTG found in this work to carry such sulfo sialylated N-glycans (Fig. 4), indicating that production of the diagnostic sulfo LacNAc oxonium ion by EThcD on Orbitrap Fusion is also not peptide backbone but rather glycan dependent. Overall, it appears that direct loss of sulfite under EThcD is the most consistent common feature indicative of sulfoglycopeptides irrespective of sialylation status and the exact glycan structures. However, in cases when good EThcD MS2 data could not be obtained, surveying for loss of sulfite, sulfite + sialic acid, or sulfo LacNAc from sialylated sulfoglycopeptides by CID MS2 will be a viable option. On the other hand, searching for a non-favorable sulfo LacNAc oxonium ion in the CID MS2 spectra is not advisable, not least due to potential one third low mass cutoff, while doing that for HCD and EThcD MS2 spectra is useful and worthy but not foolproof. Finally, it is of interest to note that the relative abundance of the major sulfated glycoforms detected for each of the three sites of bTG was significantly different (Fig. S7). Site at Asn2251 preferred disialylated biantennary N-glycan. Asn1776 carried mostly monosialylated biantennary N-glycan, whereas Asn495 preferred monosialylated and disialylated triantennary N-glycans. Taken together, the major sulfated and sialylated N-glycans contributed by all three sites are consistent with the picture gained from analysis of the released permethylated sulfated N-glycans (Fig. 2b). Although not meant to be a comprehensive analysis, our data suggest that there are site-specific distributions of the sulfated, sialylated N-glycans on three out of the nine N-glycosylation sites known to carry complex type N-glycans. Non-sulfated sialoglycopeptides were indeed detected for these other sites but not the sulfated ones at any comparable level. The identification of the diagnostic MS2 features of sulfated glycopeptides allowed us to search through a large dataset of sulfated and non-sulfated glycopeptide MS2 spectra, only a small portion of which can lead to confident ID when using search engine such as Byonic (data not shown). For a more universal application without resorting to a hybrid or tribrid Orbitrap instrument capable of trap CID and EThcD, it would be highly desirable to be able to rely on a diagnostic sulfo LacNAc oxonium ion by HCD MS2 alone akin to Q/TOF CID fragmentation to identify a sulfoglycopeptide, irrespective of the sialylation status. Prior removal of sialic acids may seem like a viable option given the success with the sulfated glycopeptides from rEPO reported above. In principle, when devoid of sialic acid, the sulfated glycopeptides may also be specifically enriched due to their carrying negative charge. On the other hand, loss of a sulfite or production of a sulfo LacNAc oxonium ion is not sufficiently specific to identify the presence of sialylated sulfoglycotopes. It is worth investigating if neutralizing the negative charge imparted by sialic acid instead of removing it may promote formation of a diagnostic sulfo sialylated oxonium ion. For these purposes, the tryptic digest of bTG was either treated with neuraminidase to remove the sialic acids or subjected to acetohydrazide/EDC modification of the sialic acids to neutralize their negative charge. By the latter approach, it was anticipated that reducing the interaction of sialic acids and the carboxylic groups of Asp and Glu with TiO2 may accentuate the negative charge contributed by the sulfate and thus favoring the selective capture of sulfoglycopeptides. Surprisingly, in the absence of sialylated glycopeptides after neuraminidase treatment, many non-glycopeptides were captured by TiO2 alongside the glycopeptides (Fig. 5a, inset). Among the 1721 HCD MS2 spectra acquired, only 59% was contributed by glycopeptides based on the criterion of detecting the oxonium ion at m/z 366.140 within 10 ppm (Fig. 5a, upper). The proportion of non-specific capture by TiO2 of non-glycopeptides (41%) was thus actually higher than that afforded when most of the bTG glycopeptides were sialylated (26%). However, on the positive side, formation of sulfo LacNAc oxonium ion at m/z 446.098 was promoted among the non-sialylated sulfoglycopeptides. Although the ion intensities of m/z 446.098 were generally low comparing to those of m/z 366.140, the selectivity was high due to high mass accuracy afforded by Orbitrap detection. In fact, 23 out of 25 spectra (2% of 1023 HCD MS2 spectra containing m/z 366.140, Fig. 4a, lower) extracted by virtue of m/z 446.098 could indeed be manually verified as contributed by sulfoglycopeptides of bTG. In contrast, only very few HCD MS2 spectra contained the diagnostic oxonium ion at m/z 446.098 when the sialic acid was not first removed to promote its formation. The impact on CID (Fig. 5b) and ETD MS2 (Fig. 5c) was somewhat expected and corroborated the observation that in the absence of sialic acid, direct loss of sulfite from the precursor was prominent and could thus be reliably used as important cues to identify MS2 spectra of sulfoglycopeptides. When the sialic acid was neutralized and modified by acetohydrazide/EDC, enrichment efficiency of glycopeptides by TiO2 resembled that of non-derivatized sample, with around 73% of the HCD MS2 spectra enumerated as glycopeptides based on the same criterion of oxonium ion at m/z 366.140. It is likely that while it did not contribute to capturing only the sulfated sialoglycopeptides, it reduced non-specific interactions with the carboxylic side chains of non-glycosylated peptides. Direct loss of sulfite moiety from the precursors by CID and ETD MS2 was similarly promoted (Fig. 6c, d) although loss of the modified sialic acid was still prominent by CID MS2. Overall, it can be concluded that stabilizing the sialic acid by neutralizing it, or the removal of it, would facilitate direct loss of sulfite moiety from the precursors by CID and ETD MS2 and that formation of peptide c and z ions would be further promoted in the latter. This echoes the initial observation from the analysis of the sulfoglycopeptides from rEPO, which were largely without sialic acids. However, formation of sulfo sialylated oxonium ions by HCD MS2 were never observed even when the sialic acid was modified (Fig. 6b). In the same spectrum, oxonium ions corresponding to derivatized sialic acid at m/z 348.140 (instead of m/z 292.103) and sialyl LacNAc at m/z 713.279 (instead of m/z 657.236) were detected, which indicated that sialic acid modification itself did not prevent formation of oxonium ion containing it. It thus appears that the strategy of sialic acid modification will not confer any significant advantage in so far as facilitating enrichment, promoting diagnostic sulfo sialylated oxonium ion, or improving peptide backbone fragmentation pattern. With the advent of EThcD on Orbitrap Fusion, sulfo LacNAc oxonium ion could now be readily detected and used as an important criterion alongside loss of sulfite to identify ±sialylated sulfoglycopeptides without the additional steps of removing or modifying the sialic acids (Fig. 4). In this work, we have shown that ±sialylated sulfoglycopeptides could be captured by TiO2 in an enrichment step with a slightly modified sample loading conditions. However, the enrichment efficiency or specificity was not improved upon removal of the negative charges contributed by sialic acids. In the absence of a more efficient method that can specifically enrich out the usually rather low abundant sulfoglycopeptides from non-sulfated glycopeptides irrespective of the sialylation status, diagnostic MS2 ions that can positively confirm their presence will be very important. Unfortunately, reliable formation of sulfo LacNAc oxonium ion by HCD MS2 was only observed with non-sialylated sulfoglycopeptides. When the sulfoglycopeptides were sialylated, both HCD and EThcD on an Orbitrap Fusion Tribrid could produce the sulfo LacNAc oxonium ion but somewhat dependent on the antennary structures of the sialylated sulfoglycans carried. These could be mass measured at high resolution and mass accuracy by Orbitrap (< 3 ppm in this work) and used as an important criterion to filter out bona fide sulfoglycopeptide MS2 spectra, as well as to discriminate against the isobaric phosphorylation. Direct loss of a sulfite moiety from the precursor by EThcD could be relied on as an independent or corroborative evidence, whereas a dual considerations for loss of sulfite and sulfite + sialic acid can be adopted for trap CID MS2 data, all of which can be mass measured at high mass accuracy on an Orbitrap. The latter would assist cases when productive EThcD was not acquired, or in instrument that does not offer the EThcD option. Any identification of glycopeptide by a combination of HCD, CID, and EThcD is still not a trivial issue [13, 24] even when the MS2 data can now be searched against database using a few software programs developed by academic groups or the commercially available Byonic [11, 35]. These usually allow for additional considerations of sulfate, or can be configured accordingly either as a modification, adduct, or by expanding the glycan library used. It nevertheless increases the search scape and adds to the associated uncertainties. We showed here that, in general, the presence of sulfate did not significantly alter the kind of fragment ions and information one can derive from different MS2 modes and thus subject to the same successes and pitfalls in MS2-based glycopeptide identifications. The ability to distinguish the presence of a sulfate on glycopeptide from other glycosyl combinations or peptide modifications would therefore be critical to reduce the likely false assignments. In this context, the use of basic tripeptide for ion pairing on sulfated glycopeptides that was reported to not only allow discriminating against isobaric phosphorylation but would also enhance trap CID fragmentation to yield more informative glycosidic cleavage ions [36, 37] is worth exploring. In particular, it remains to be investigated how the useful features afforded by ion pairing may similarly extend to more complex sialylated sulfoglycopeptides with longer peptide backbones typically encountered in glycoproteomics. We have established the basics, but the field is still wide open for incorporating any experimental approach that may improve on the complementary use of HCD and EThcD now available on the high mass accuracy Orbitrap instruments, to enable a more efficient and definitive identification of sialylated sulfoglycopeptides. This work was financially supported by an Academia Sinica Investigator Award grant to KKH and partly by the Research and Development Program of New Drugs and Vaccines for Critical Diseases of Academia Sinica and Ministry of Science and Technology (MOST 104-0210-01-09-02, MOST 105-0210-01-13-01, MOST 106-0210-01-15-02), Taiwan.